The sun’s hard and harsh rays are sadly forcing the strawberries into oblivion. 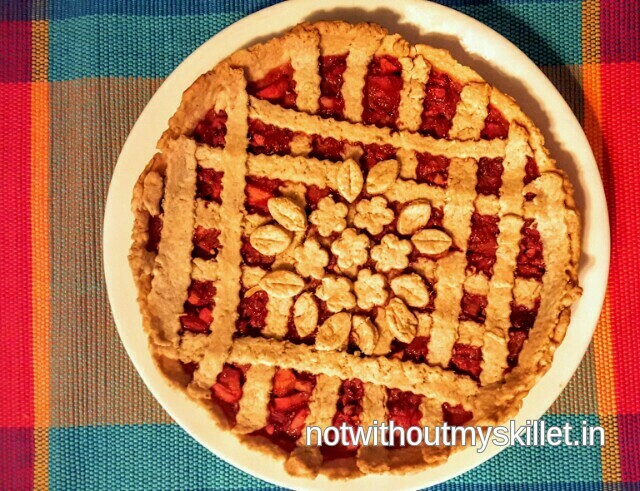 🙁 But I must say, this year, I’ve eaten strawberries almost right through the season and I bid adieu to my most favourite fruit with nothing less than a sugar-free pie! There’s something about this luscious fruit with at least 200 seeds that makes people go crazy about it. It’s believed that in the yesteryears, the royals feasted on this fruit and newlyweds were entitled to strawberries with soured cream as a wedding breakfast, believing them to be an aphrodisiac. I however dig them for their nutritional value: vitamin C and K, a good dose of fibre, folic acid, manganese and potassium and they help regulate blood sugar levels. Could I ask for more? A healthy snack that warms to heart and belly alike. 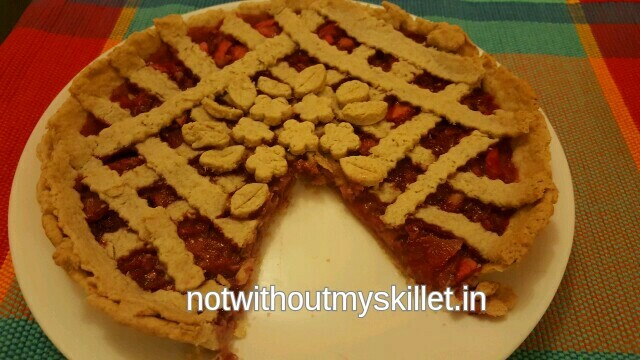 In this pie, strawberries find a companion in apples and almonds. Strangely when I looked up my Flavour Thesaurus, apple and strawberries didn’t show up as compatible mates…but almonds worked with both of them individually. 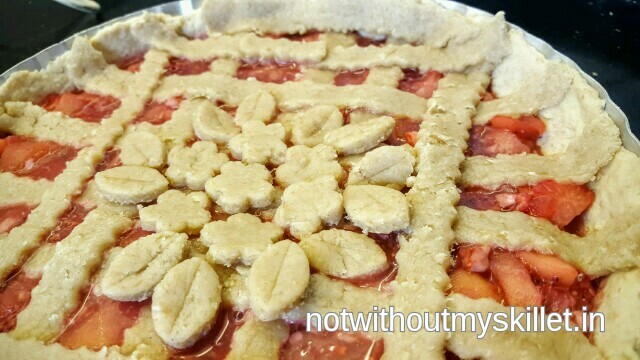 Though a bit skeptically, I followed my gut and ended up with a delicious strawberry and apple pie. 1. Mix the oats and flour together. 2. Mix in the butter with your fingertips to form a breadcrumb like texture. 3. Use very little water to bind the dough together. Cover with cling film and cool in fridge for at least 30 minutes. 4. 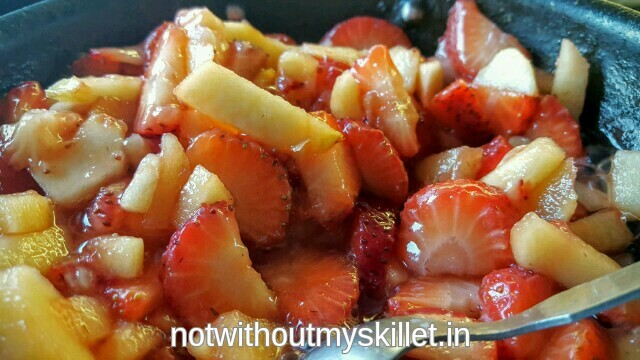 Now to a skillet, add a tablespoon of butter and cook with strawberries and apple together. I did not need to add sugar but if you do, add sugar to taste at this stage. If using rum, add it at this stage. 5. When cooked take it off the flame and cool. 6. Add the coarsely crushed almonds. 7. Pre-heat your oven to 200 degree centigrade. 8. Line a baking pie dish with butter or butter paper. 9. Take the dough out of the fridge and divide it into two parts. Roll one out on a flat surface. 10. Place the rolled out dough on the buttered baking dish ensuring that it covers the sides of the dish too. 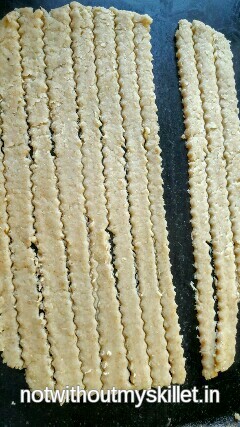 If you have pastry running over the edges use a rolling-pin to cut it off. 11. Blind bake the pie crust in the hot oven for 20 minutes. 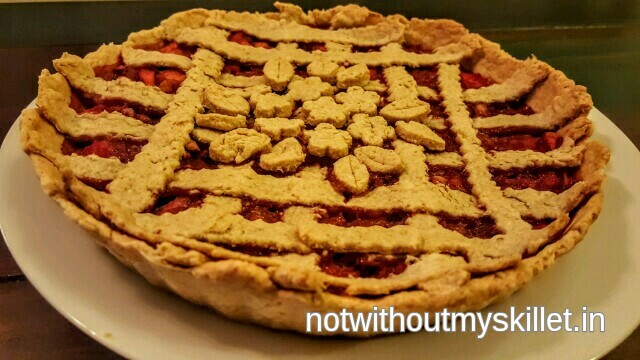 You need to use baking beads or pierce holes into the pie crust to make sure it does not rise. 12. Roll out the other half of the dough and cut it using cookie or pasty cutter or use a round top to cover your pastry. I’ve used flowers and leaves. Strips, flowers and leaves: a pretty design that added biscuity texture! 13. When the crust is nice and crisp, take it out. 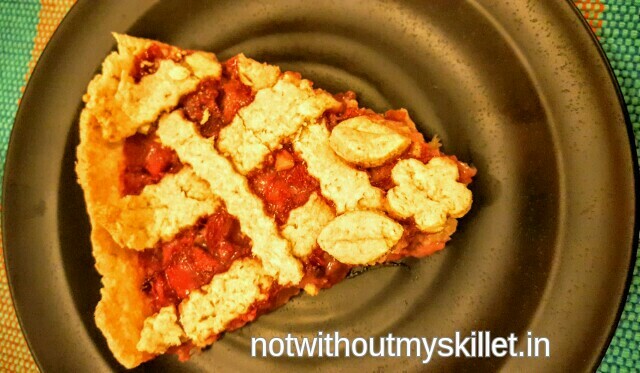 Add the pre cooked apple and strawberry mix and cover it with a design of your choice on top of the apple and strawberry mix or use the second round you’ve rolled out. If using a covered top, make a tiny cross at the centre. This ensures complete cooking and also allows some of the gorgeous filling to flow out and give your pie a stunning look! 14. Eat it hot with cold ice cream or cold with cream and strawberry sauce!